The Local Climate Impacts Profile (LCLIP) approach was developed by the UK Climate Impacts Programme (UKCIP) as a tool to help local authorities assess vulnerability to extreme, local weather impacts in the UK. The London Climate Impacts Profile is an LCLIP for London and reviews the ways in which weather has impacted service provision in London over the last 10 years (1998-2008). It involved a media trawl of 3 newspapers (the London Evening Standard, the Times and the Guardian), interviews with ten organisations and an analysis of Met Office data for specific events. An LCLIP is not a risk assessment but a simple tool to enable engagement and communication about climate change adaptation. It was carried out be consultants AEA on behalf of the London Climate Change Partnership and London Councils. 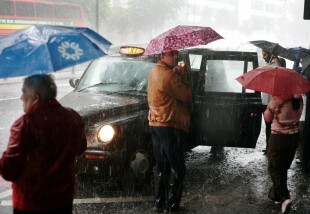 Over the past ten years, London has experienced many extreme weather events such as dry weather (drought), low temperatures, high winds, snowfall, high temperatures and heavy rain. More than half of the weather impacts reported were related to the transport sector. Other sectors affected included health, safety and humanitarian services, recreation and environment, emergency services, and local government sectors. The research included interviews with ten organisations operating across London which had significant impacts from weather events, looking at the extent of the impacts on them and how they dealt with the situations. But the past is not a guide to the future. The latest UK climate projections show that some types of weather will become more frequent and more extreme. Organisations need to consider how they might be affected by such extreme weather in the future, and what they can do now to reduce the risks. The LCLIP approach focuses on identifying locally experienced weather-related impacts, placing emphasis on increasing the resilience and reducing the vulnerability of a given locality. London Councils, the London Climate Change Partnership and the UK Climate Impacts Programme (UKCIP) will now be assisting 22 of London’s boroughs to carry out local climate impact profiles, for which this work is a short preparation. As well as the report, the Partnership and London Councils are making available a spreadsheet of the findings of the research, setting out the 145 media stories and 300 impacts found in the course of the project.